Local Plans set out a vision and framework for the future development of an area, addressing needs and opportunities in relation to housing, the economy, community facilities and infrastructure – as well as a basis for safeguarding the environment, adapting to climate change and securing good design. The Local Plan is an essential tool for guiding decisions on individual development proposals and is the starting point for considering whether a planning application can be approved. The Tamworth Borough Council Local Plan 2006-2031 is our current adopted Local Plan and sets out the vision and spatial planning strategy for Tamworth and allocates parts of the town for new homes and employment land to meet local community and business needs up to 2031. Our Local Plan was adopted by Council on Tuesday 23rd February 2016 after the conclusion of its independent examination. 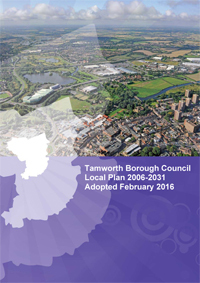 The Local Plan 2006-2031, along with the saved policies of the Local Plan 2001-2011, is the main document of the development plan for Tamworth. You can view the Local Plan and accompanying documents below. You can get further information or advice by phone on 01827 709709 or by emailing developmentplan@tamworth.gov.uk.